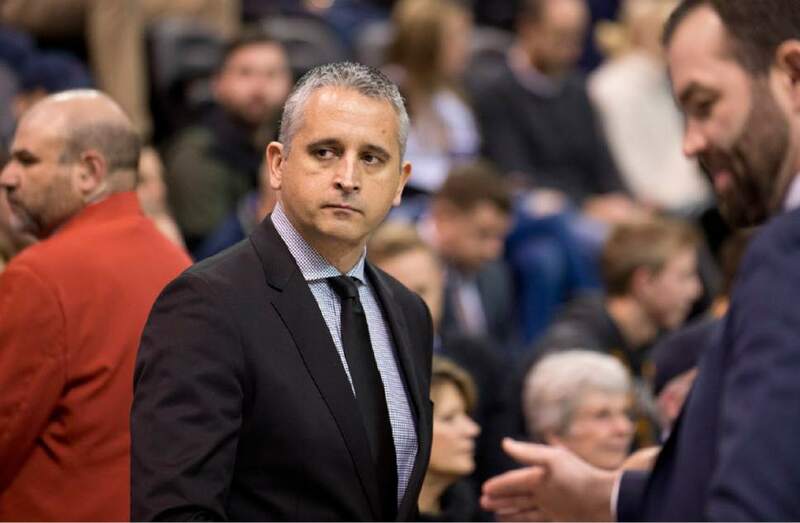 Jazz • Assistant coach Igor Kokoskov's playing days ended in a car crash, but a coaching career blossomed from it. Lennie Mahler | The Salt Lake Tribune Utah Jazz assistant coach Igor Kokoskov stands on the sideline before a game against the Oklahoma City Thunder on Monday, Jan. 23, 2017, at Vivint Smart Home Arena in Salt Lake City. 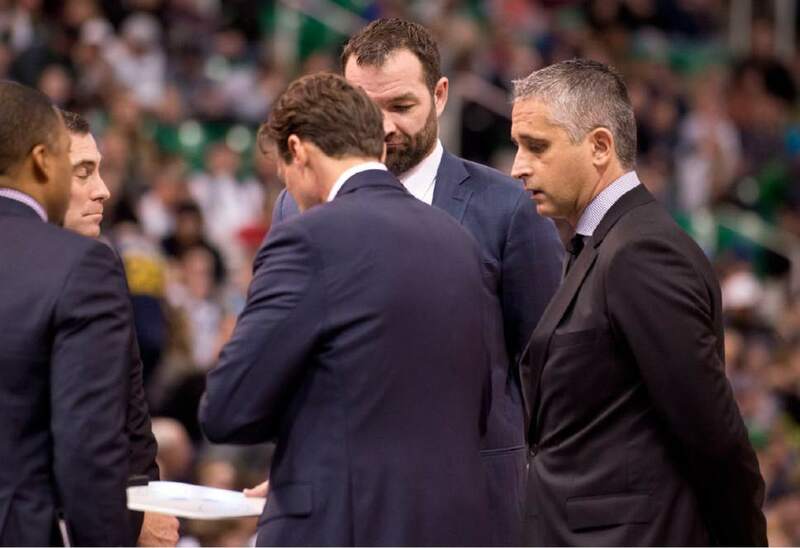 Lennie Mahler | The Salt Lake Tribune Utah Jazz assistant coach Igor Kokoskov meets with other coaching staff during timeout of a game against the Oklahoma City Thunder on Monday, Jan. 23, 2017, at Vivint Smart Home Arena in Salt Lake City. Epiphanies in life come at different times and different places for different people. Igor Kokoskov&apos;s came in a small hospital room in Serbia in the early 1990s. Kokoskov today is the top assistant coach for the Utah Jazz. Back in those days, though, he was an athletic 18 year-old looking for a way to break into professional basketball, like Vlade Divac and Toni Kukoc  a pair of high-profile internationals from Serbia and Croatia, respectively, who went on to stardom in the NBA. A serious car accident  a near-fatal head-on collision  changed that. Kokoskov&apos;s knee was mangled. His dreams of playing pro ball were shattered. His injuries took months to heal. As he lay in that hospital bed on many nights, he knew his playing days were finished. "I was still a teenager," Kokoskov said. "It changed my life. I knew from that point on that I couldn&apos;t play the game. But I was always in love with the game, so I told myself that I would stay in the game. I never had a doubt that I would stay in basketball, in some capacity." Kokoskov knows he&apos;s lucky to be alive. Every game, each practice and every after-practice session with the Jazz players he&apos;s responsible for, he attacks it like it&apos;s his last. Kokoskov has become a trailblazer, and is one of the most experienced assistants in the NBA. He&apos;s the first international assistant in league history, and was on the bench when the Detroit Pistons won the NBA title in 2004. Yet, that collision allows him to stay grounded each day. Kokoskov is one step from becoming a head coach in the NBA. He&apos;s the current head coach of the Slovenian national team. But even Kokoskov&apos;s friends say they would have liked to see where his playing career could have taken him. "He could&apos;ve been a great player," said Divac, currently the head of basketball operations for the Sacramento Kings. "He was an excellent player before the injuries. I&apos;m glad he&apos;s in the NBA. He&apos;s a very intelligent coach, who has a great knowledge of basketball. We are close friends, and he&apos;s very, very important to Serbian basketball. I&apos;m very proud of him." Coach Quin Snyder made a name for himself as a point guard at Duke, then turned that into a gig on coach Mike Krzyzewski&apos;s staff after graduation. By the late 1990s, Snyder had become one of the most sought-after young coaches in college basketball before becoming coach at Missouri. In building a staff, Kokoskov was one of his first hires. "It was an easy call," Snyder said. The two met while Snyder was still at Duke and Kokoskov was on a tour of American schools. The two became fast friends. "We were kindred spirits," Snyder said. "He stayed a week, and then he stayed another week. When I got hired at Missouri, I wanted him with me." That hire made Kokoskov the first full-time European assistant coach in NCAA Division I history. "He left me," Snyder said with a laugh. Kokoskov in 2000 became the first non-American assistant in the NBA when the Los Angeles Clippers hired him. He spent three years in Los Angeles with Alvin Gentry before moving to Detroit. By the time Kokoskov would come full circle with Snyder in 2015, he had worked with the Phoenix Suns, the Cleveland Cavaliers and the Orlando Magic. "I&apos;ve been in the league for 17 years, so I&apos;m getting old," Kokoskov said. "I&apos;ve been in the league for a long time. It&apos;s taught me to be who you are. I&apos;ve worked with great coaches in the NBA and overseas. I&apos;ve tried to take a piece of everyone I&apos;ve worked for and try to make your own philosophy." Kokoskov&apos;s maturity allowed him to climb the ranks quickly. He&apos;s seen and been through a lot, on and off the floor, though he says he was never directly affected by the civil war that tore Yugoslavia apart. During those years Kokoskov lived primarily in Belgrade, so he never had to endure the destruction and atrocities other Serbs, Croats and Bosnians did. But the conflict still weighed on him and his family. Kokoskov still thinks about what could&apos;ve been in his native land. "It was sad, because Yugoslavia was one of the best multi-racial and religious countries in the world," Kokoskov said. "From many perspectives, lifestyles, it reminded me a lot of the United States. It wasn&apos;t always a country divided. It was a good place to live and grow up. It just goes to show that it&apos;s easy to put ... hate between people." Kokoskov has a reputation as one of the most well-rounded assistants in the NBA, as well as one of the most experienced. Snyder calls him one of the most respected offensive minds in the league. His player development abilities are noted, even by veterans. Almost a decade ago, when Kokoskov was in Phoenix, he was instrumental in working with Steve Nash. Kokoskov does the same with the Jazz, working closely with point guard George Hill. The two have been together for half a season, but already Kokoskov has made an impact on Hill. "It&apos;s different, working with him," Hill said. "The things that he has me do is different than I&apos;ve been used to. But what he&apos;s had me do is phenomenal, little things that I didn&apos;t know would help me become a better shooter and better off the dribble, things like that. We take a lot of time doing balance and core. You always want to work with someone who&apos;s experienced, and Coach has been very good for me." From that hospital room to across the globe, Kokoskov took his life-changing experience and made the most of it. From Nash, to Hill and to Goran Dragic, Kokoskov has had an effect on some of the best point guards the game has seen the past two decades. And from Divac, to Peja Stojakovic, Koskoskov has forged a name for himself as one of those who changed the face of Serbian basketball. In 2006, he became the first international assistant in the NBA All-Star game. In 2009, he became an U.S. citizen. And he&apos;s just 45 years old. "He&apos;s been around for years," said Jazz forward Boris Diaw, who played for Phoenix when Kokoskov was on the Suns&apos; staff. "He has a lot of knowledge and experience, and he&apos;s great for us. It&apos;s great to see how he&apos;s grown since Phoenix, when he had a position that wasn&apos;t as high up. Now he has more input in what we do, and you can tall how far he&apos;s come." • From 2008-2006, he was the head coach of the Georgian National Team. • Kokoskov is 1-0 as a head coach. On Dec. 5, 2016, he took over for Quin Snyder, who fell ill before a game with the Los Angeles Lakers. The Jazz won 107-101. • Kokoskov was awarded the Order of Honour  Georgia&apos;s highest civilian honor  in 2011. • Kokoskov has coached in an Olympics, and an NBA all-star game. He also has won an NBA title. About the Jazz • Looking to even the season series with the Grizzlies at two games apiece. … Point guard George Hill has struggled to find his shot of late, shooting 35 percent from the field over his past five games. … Shooting guard Rodney Hood returned to the starting lineup after missing two weeks with a hyperextended right knee. About the Grizzlies • Center Marc Gasol was selected as a Western Conference all-star. … Opened a six-game road trip Friday in Portland before taking on the Jazz on Saturday. … Along with the Jazz and the Mavericks, one of the three slowest-paced teams in the NBA.